There is one phrase that sums up summer squash fairly easily: bigger is not better. It can be tempting to buy a huge zucchini and think to yourself “I only have to use one vegetable to make an entire loaf of bread!” But thinner, smaller squash usually equals better flavor. The root side of the plant should be substantially smaller than the vegetable itself and the flowering side (the pointy end) should have very little scar from the squash blossom. Also, if you cut or crack open a squash and see a lot of seeds, the vegetable is likely too ripe and was left on the plant for too long. When a cucumber is picked from the plant at the right time, it literally snap off the vine; that’s how crisp it is. It should also be firm, but still provide a little give when handled. An unripe cucumber feels almost prickly on the outside and the bumps and grooves will feel too defined. And a cuke that seems to wobble when you shake will go bad very soon. The perfect cucumber is almost as crisp as a ripe apple, and should crunch when you take a bite of it. I know you’ve been told to gently squeeze a tomato to gauge its ripeness. But even the most gentle pressure could cause a bruise to develop within a matter of hours. The best way to gauge a ripe tomato is by color. For example, when you see a large amount of tomatoes together at the market, a richer, deeper color means a tomato is at its peak. 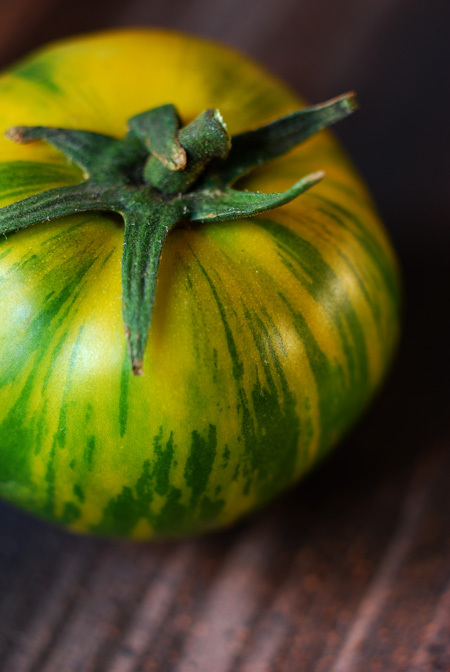 Granted, with all of the heirloom varieties gracing the market, relying on color can be tricky. Don’t be embarrassed to ask someone who will know for sure. One of my favorite tomatoes is the Green Zebra. 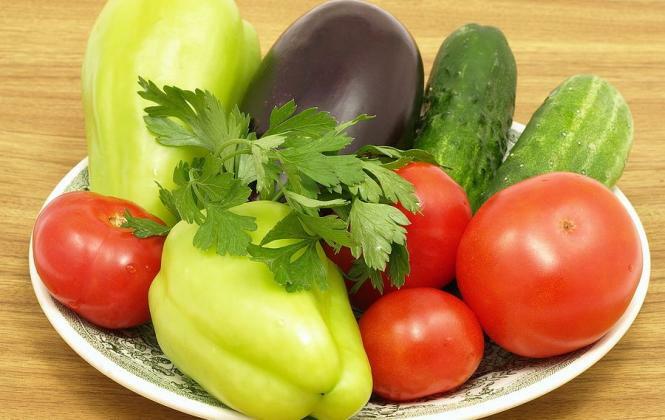 Like all tomatoes, it starts out green, but then also ripens to green. So what’s the secret to knowing it’s ready for salsa? When these bad boys are ripe, their characteristic stripes actually turn bright yellow. You can also judge the ripeness of a tomato by its weight. Pick it up; it should feel heavier than it looks. This translates to a juicy and delicious interior. It is always better to buy under ripe then over. A tomato will ripen with time if left on the counter – as all tomatoes should be until they are cut. And never, ever store a tomato in the refrigerator. I have been most excited by the variety of eggplant I’m finding now. White eggplant, striped eggplant, green eggplant – all the varieties make for the most beautiful dishes. The easiest indicator of a ripe eggplant is a stem that seems to grow down onto the vegetable. Generally speaking (it can vary a bit by variety), the stem growth should stretch between a quarter and a third of the way down the vegetable. Once you start to think of eggplant this way, you will be excited by the ability to buy them small, large and every size in between. Beware: peppers can rot very fast. So you’ve got to be extra smart about how you buy them. You should start by holding them in your hand; how do they feel? Ready-to-buy peppers should be firm and crisp. The stem should be well attached to the base of the pepper. The skin should feel and look consistent. Hot peppers (especially jalapeños) will develop a bit of a rough and etched texture. Worms also love peppers. To avoid any surprises, it is best to make sure there are no holes in the vegetable; this is especially true around the base. Also, like tomatoes, a pepper will ripen off the plant on your countertop. It’s a great feeling knowing that you got the best tomato, the crispiest cucumber, or the most flavorful pepper. Just follow my advice, taste test often, and talk to people who know what to look for. Then, when you bring home your bounty, throw them all together in this recipe, courtesy of RecipeTips.com. Place eggplant in colander, sprinkle with salt and let set 30 minutes to drain. Roast peppers over grill or in over until blackened on all sides. Wrap in paper bag and let sit for 15 minutes. Peel, seed peppers, cut into half-inch pieces. Pat eggplant dry. Combine eggplant, zucchini, water, oil, garlic, and dried red pepper in medium saucepan. Bring to simmer over medium heat. Add tomatoes and cook until vegetables are almost tender, stirring occasionally, for about 15 minutes. Stir in roasted red peppers and simmer until all vegetables are very tender and almost all liquid is evaporated (35-40 minutes). Stir olives into vegetable mixture. Season with salt and pepper. Cool to room temperature (can be made two days ahead; chill). Bring to room temperature before serving. Serve with pita bread. Optional: Sprinkle shredded Parmesan or Asiago cheese on top. Alicia Jabbar is a self-described foodie, cook, and advocate for local and delicious foods. Last year she spent seven months living and working on a farm on the East Coast. Now she's in Boulder, Colorado, where she's interested in becoming an organic farmer. The single best aspect about food, she says, is the community it engages and the conversation it creates. We couldn't agree more. Her last post for Simple, Good and Tasty was Farmers Markets from the Other Side of the Table.